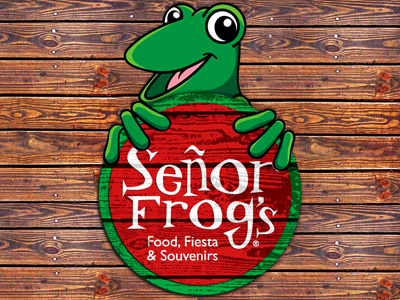 Señor Frog’s at Treasure Island is a Mexican party every day. This cantina has a fun vibe and the servers all take part in the crazy activities that make Señor Frog’s an entertaining place to hang out. The restaurant serves Mexican favorites like fajitas, steak tacos and burritos. It also has a variety of salads, burgers, sandwiches and wraps. The bar makes delicious drinks offering a variety of margaritas, froggi-tini’s and tropical drinks. Stop in and have some fun! Nightly entertainment at Señor Frog’s Las Vegas includes fun contests, shot girls, live music and/or DJs. Enjoy the A.Y.C.E tacos on Tuesday nights or “Latin” night on Saturdays. Happy hour every day from 3 PM – 6 PM. We were greeted by a couple Senor Frogs employees just outside the resturant – gave us coupons for ’2 for 1′ yard drinks – went into resturant and they wouldnt allow us to use them because they were closing in an hour (at midnight). They wouldnt serve us food either. They had crappy hip hop music that was way too loud. We ended up leaving without ordering anything – what a waste of time. We had a taco and Cobb salad. The lettuce was wilted and the dressing was flavorless. Service was good though. Won’t go there again; too many other great options. We were mislead about the happy hour special. Long story short … We got a bill $160 bill that should have been half. They said the happy hour was on different drinks n sizes, when at the beginning of our drinking they were on our drinks. Food was okay, but everything else about this place is awesome!! The music, atmosphere and drinks were great. Would recommend this place for sure! We waited an hour and twenty minutes because our waitress for our table mixed up with another, food wasn’t food and we will not be back! Loved it. Drinks were expensive, but it was good. Tacos were great.